We’d love your help. 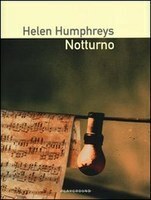 Let us know what’s wrong with this preview of Nocturne by Helen Humphreys. Helen Humphreys’ younger brother was gone before she could come to terms with the fact that he had terminal cancer. Diagnosed with stage 4B pancreatic cancer at the age of forty-five, he died four months later, leaving behind a grieving family. Martin was an extraordinary pianist who debuted at the Royal Festival Hall in London at the age of twenty, later becoming a piano Helen Humphreys’ younger brother was gone before she could come to terms with the fact that he had terminal cancer. Diagnosed with stage 4B pancreatic cancer at the age of forty-five, he died four months later, leaving behind a grieving family. Martin was an extraordinary pianist who debuted at the Royal Festival Hall in London at the age of twenty, later becoming a piano teacher and senior examiner at the Royal Conservatory of Music. The two siblings, though often living far apart, were bonded on many levels. This lovely book is not a memoir; it's a tribute to the author's late brother, and it reads like a series of small conversations with him. Near the end of the book, she explains that she decided on 45 chapters, one for each year of his life. Some are as short as a couple of lines, but all are meaningful. Her grief is palpable throughout the book. The sense of loss, of a life cut too short by invasive cancer, is so touching that at times I cried along with her. When she described sitting at a windo This lovely book is not a memoir; it's a tribute to the author's late brother, and it reads like a series of small conversations with him. Near the end of the book, she explains that she decided on 45 chapters, one for each year of his life. Some are as short as a couple of lines, but all are meaningful. When she described sitting at a window, staring into the darkness unseeingly, I understood her bleakness, and ached for her. This is superb - one of those books you wish you hadn't read, just so that you could have the pleasure of rediscovering it. This is a very moving, beautifully (and deceptively simply) written memoir of the author's late brother; a reflection on his life, on her sense of loss, and on the fragility of the moment. You will cry. A very moving memoir and testament to the life and untimely death (at 45 from pancreatic cancer) of author Helen Humphreys's brother, Martin, a concert pianist and composer. This is not an easy read. The sensitive observations of the world after one who is deeply loved has died remind readers of the rawness of their own grief. A painfully beautiful book. Beautiful writing and a very touching book! Yes it's a memoir about the author brother death, and so it can be seen has a very personal book, but I found the experience to be very well «generalize» so it isn't anymore about her personal grief, but about grief and passing on in general, something we'll all get through somehow one day or another. It isn't a happy read but not a depressive eon either, just a very well made reflexion on the matter. Big surprise and I highly recommend it! I rarely give books five stars, but I think this one deserves it. This slim book is the author's poetic and beautiful reaction to her brother's death at the age of 45. There are 45 chapters in the book. Helen Humphreys details how her brother died, what has happened since, and talks about many instances of their life together. This is a raw book about grief, and the way grief can influence how a person sees the world. It is about sibling love and how life is both beautiful and terrible.I also ap I rarely give books five stars, but I think this one deserves it. This slim book is the author's poetic and beautiful reaction to her brother's death at the age of 45. There are 45 chapters in the book. Helen Humphreys details how her brother died, what has happened since, and talks about many instances of their life together. This is a raw book about grief, and the way grief can influence how a person sees the world. It is about sibling love and how life is both beautiful and terrible.I also appreciated how Helen tied art and the practice of making art into the text. A beautiful winding, nostalgic memoir of grief. Helen Humphreys' younger brother, a piano prodigy, was struck with a diagnosis of pancreatic cancer. She struggles, through her poetic writing, to come to terms with his untimely death. This book is a testament to her love and gratitude for her brother Martin, she both admired and mentored. I had the privilege of knowing Martin as a friend. It is not everyone who has a gifted writer as a sister, one who is able to pay tribute to a life in a way that moves and touches many readers who never knew him. Beautiful. Terribly sad. Incredibly written. Heartwrenching. Read it. In this small miracle of a book, Helen shares the letters she wrote to her brother after his untimely death at 45. A classical pianist who was a young prodigy and with whom she grew up artistically, he was taken too young by cancer diagnosed too late. This is a heartache of a book that details the indignities and unconscious cruelties visited on the grieving: the bargaining for a cheaper price when she was trying to sell her brother’s car, the long delay at the MTO, the doctors’ clumsy metaphors In this small miracle of a book, Helen shares the letters she wrote to her brother after his untimely death at 45. A classical pianist who was a young prodigy and with whom she grew up artistically, he was taken too young by cancer diagnosed too late. This is a heartache of a book that details the indignities and unconscious cruelties visited on the grieving: the bargaining for a cheaper price when she was trying to sell her brother’s car, the long delay at the MTO, the doctors’ clumsy metaphors (which she sees through immediately), the detritus left behind by the dead that the living must find a way to deal with. She details the need to sleep in his sheets and wear clothing that still smelled of him, to take from his apartment small things of meaning. She revisits the early optimism and the slow progress to hopelessness, and the awful, pungent, and inexorable approach of death. But this is also a book about a life making art, because after he died she nearly stopped writing: “I wanted to give up writing after you died, Martin. There seemed no point to it anymore. Maybe because we had grown up as artists together I felt I couldn’t go on alone.” And so it is also about the life of not just one artist but two: Martin was a musician and composer, Helen a writer, and they lent moral support to one another as artists growing up. They traveled together, shared hopes and dreams, let the other’s existence and life choices give emotional backbone to their art. It’s a kind of luck that Helen acknowledges in various ways through the book, by affirming their bond, memories of their childhood and youth and young adulthood, and by sharing the story of these. It’s courageous and open-hearted and generous, a thing of rare beauty and wisdom fashioned from the most exquisite pain. Martin lives in these pages, and the unconscionable fact of his too-early death given meaning by the way he will live on, known in some small way by readers. This is a beautiful book; my thanks to Alexis for reviewing it. Helen Humphreys writes with great love and longing for her younger brother, Martin - a gifted pianist, who died of cancer at a young age. It was a relatively short period of time from the diagnosis to Martin's death, and it left Helen reeling. She addresses the book to Martin and interweaves accounts of his last days with reminiscences of their time together as children, teens, and adults. Her writing is elegiac and reveals Martin a This is a beautiful book; my thanks to Alexis for reviewing it. Helen Humphreys writes with great love and longing for her younger brother, Martin - a gifted pianist, who died of cancer at a young age. It was a relatively short period of time from the diagnosis to Martin's death, and it left Helen reeling. She addresses the book to Martin and interweaves accounts of his last days with reminiscences of their time together as children, teens, and adults. Her writing is elegiac and reveals Martin as a delightful, thoughtful, caring man while also revealing the loving, caring side of the author. The book is worth reading for its own sake but it might also be a comfort for people who have lost a loved one, as it expresses a universal grief. A moving account of Helen Humphrey's brother's life and death - encompassing his career as a pianist, her writing and their lives in the UK, Kingston, Toronto and Vancouver. She writes about the legacy of grief, that she is now "brought to my knees anytime something bad happens to a person or a creature that I love. I can't stop myself from fearing the worst, because the worst has happened." She is always a wonderful writer and this short book is a sad and elegiac tribute as well as a vivid portr A moving account of Helen Humphrey's brother's life and death - encompassing his career as a pianist, her writing and their lives in the UK, Kingston, Toronto and Vancouver. She writes about the legacy of grief, that she is now "brought to my knees anytime something bad happens to a person or a creature that I love. I can't stop myself from fearing the worst, because the worst has happened." This is Helen Humphreys' beautiful and simply profound memoir about the mid-life loss of her beloved brother, concert pianist Martin Humphreys. From a grief experience most of us could only say is 'too deep for words,' this author has listened deep, created those words, and generously shared her experience in clear, honest prose. It is a remarkable, soul-enriching gift to anyone who has lost someone they love. Helen Humphreya' delicate and insightful memoir about her brother, Martin, gave me language to express my feelings about the deaths of my much loved and respected mother and kid brother. They died one year to the day apart. Did not realize how permanently teardrops become fastened to a page. Thank you Helen and Martin. Terribly sad. Terribly beautiful. This will make you cry. This memoir of the grief following the death of the author's brother is tender, sweet, visceral and haunting. She oscillates between tender childhood memories and raw, gritty details about incisions and piss bags. There are stunning sections of poetic beauty and chapters recounting the sheer horror of end-of-life realities. Humphreys captures every nuance of the torrential pain that accompanies grief. This is poetry for the broken, ragged s Gorgeous. A powerful, echoing little book. Some really beautiful bits that hit you like a punch to the gut. Even the occasional awkward moments just make everything that much more poignant. 3.5 stars. A very personal reflection on the life and loss of her brother. Beautifully written, but I almost felt uncomfortable at times because it was such an individual and personal account. Really liked the openness of the author's thoughts and feelings about both her brother's life and death. A lovely writing style too. 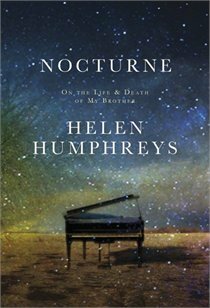 Nocturne is a heartfelt, intensely personal book written by Helen Humphrey’s addressing her late brother, Martin. The pain of losing her brother, the comfort of memories, his music and the importance of support are key messages in this book which was published in 2013. It is very different from the melodic fiction of The Evening Chorus and Coventry which are historical fiction placed during the first and second world wars. I wish that I had read Nocturne prior to meeting Helen Humphreys in May 2016 as it gives great insight into the author’s experience with loss and pain along and her quest to write stories with happy endings. “Go”, without any hesitation at all. We still need something to dream on, even when we are dying . We still need plans, even when we are out of time. We still need to feel alive”. He was the middle child. They shared their art, Helen with writing and Martin with music. He was a child prodigy who began piano lessons after watching Helen learn from the sidelines. She struggled with her lessons while he was able to play her pieces flawlessly – her lessons ceased and Martin’s became a child prodigy. As a health professional, I think that this is an important story to read. It is important to hear how families perceive the metaphor’s that are used for dying and for fighting the battle against cancer. It is important to think of the key role that can be played in supporting the patient and their family at such a difficult time so that families know that they are not alone. It is a great reminder of the difference palliative care providers make to patients who are dying and to their family who experience the pain and loss. I have a complicated relationship with Canadian poet and novelist Helen Humphreys’ poignant memoir Nocturne – On the Life and Death of My Brother. •	Humphreys is a lesbian and I am a gay man. Helen Humphreys knows that life goes on. I continue to write. I continue to read. I continue to listen and play music. I continue to love. I know that life goes on. But for both Helen and me, life continues under a shadow. A nocturne is a musical composition, inspired by or evocative of the night. In its most familiar form, it is a single-movement character piece written for solo piano. With that description, it’s not difficult to see how fitting the title for Helen Humphreys’ memoir truly is, both channelling the spirit of the story, as well as its subject. The ebb and flow between Humphreys’ disjointed memories regarding her brother is almost musical in its own right. Despite the vivid pictures the author paints, A nocturne is a musical composition, inspired by or evocative of the night. In its most familiar form, it is a single-movement character piece written for solo piano. With that description, it’s not difficult to see how fitting the title for Helen Humphreys’ memoir truly is, both channelling the spirit of the story, as well as its subject. The ebb and flow between Humphreys’ disjointed memories regarding her brother is almost musical in its own right. Despite the vivid pictures the author paints, I often found myself chuckling at her brusque comments accompanying the descriptions, then wound up almost in tears at the sheer sadness the author was able to evoke during Martin’s last moments. The true testament to the author was her ability to keep the story moving forward so fluidly while jumping to different points in her life and flipping between extremes in emotion. Martin himself was a living, breathing musical composition. Clearly inspired by the night, where he found himself most creative, the accomplished pianist was far too optimistic to be defined by the sadness surrounding his tragic death. Through Martin, the author not only shows the literal woe of a man taken at such a young age, but also how we find ourselves unable to shake free of the responsibilities of our lives to do what we really want, even at the end. I have mightily enjoyed several of Helen Humphreys' novels, notably The Reinvention of Love and Coventry. This is a memoir of her beloved brother Martin, a concert pianist who died of a galloping cancer at the age of 45. I can see why she felt the need to write the book (it's dedicated to her sister, who shared her love for their brother), but I think perhaps she shouldn't have sent it out to the world. While some parts of the book are very moving, others are intensely irritating. It's hard to pu I have mightily enjoyed several of Helen Humphreys' novels, notably The Reinvention of Love and Coventry. This is a memoir of her beloved brother Martin, a concert pianist who died of a galloping cancer at the age of 45. I can see why she felt the need to write the book (it's dedicated to her sister, who shared her love for their brother), but I think perhaps she shouldn't have sent it out to the world. I started reading this book almost a year ago, according to Goodreads, though I think I started it when I met Helen at the Sage Hill Writing workshop in the summer of 2014. So, after almost 2 years, I have finally finished it. It is, of course, a very small book, just tickling at 200 pages without reaching it. But it is a gut punch, and one that I felt, for some reason, was best read sporadically, in small bursts of some 20 pages at a time, spanned between months. While I keep taking books down f I started reading this book almost a year ago, according to Goodreads, though I think I started it when I met Helen at the Sage Hill Writing workshop in the summer of 2014. So, after almost 2 years, I have finally finished it. It is, of course, a very small book, just tickling at 200 pages without reaching it. But it is a gut punch, and one that I felt, for some reason, was best read sporadically, in small bursts of some 20 pages at a time, spanned between months. While I keep taking books down from my currently reading that I have given up on, I've never considered myself necessarily having stopped reading this one. I kept it there and kept, slowly, coming back to it, each time breaking off a little bit more of my heart. I found this book by coincidence. I was looking through a bookshelf at the local bookstore, just wandering, because I didn't want to go home. I just came from mom's funeral and I didn't want to return to my empty house. She died of the same cancer as Martin, the brother to whom Humphreys narrates this book. Her voice in the book is talking directly to her late brother. I relate to that action. Still, I did not, overall, enjoy this book. There are some paragraphs that are well-written, and that r I found this book by coincidence. I was looking through a bookshelf at the local bookstore, just wandering, because I didn't want to go home. I just came from mom's funeral and I didn't want to return to my empty house. She died of the same cancer as Martin, the brother to whom Humphreys narrates this book. Her voice in the book is talking directly to her late brother. I relate to that action. Still, I did not, overall, enjoy this book. There are some paragraphs that are well-written, and that resonate with my very recent loss. But much of the book, too much, is memories to which only those 2 can relate. Her first novel, Leaving Earth (1997), won the 1998 City of Toronto Book Award and was a New York Times Notable Book of the Year. Her second novel, Afterimage (2000), won the 2000 Rogers Writers Helen Humphreys is the author of four books of poetry, five novels, and one work of creative non-fiction. She was born in Kingston-on-Thames, England, and now lives in Kingston, Ontario with her dog, Hazel.